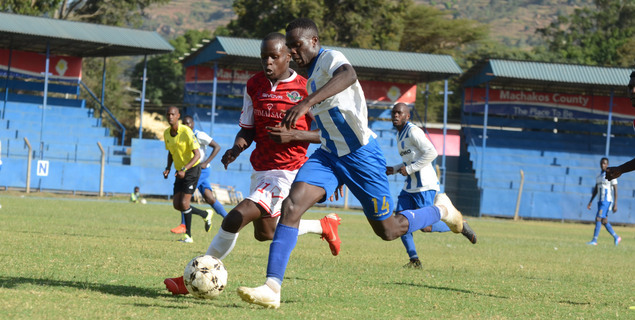 Tanzanian Marcel Kaheza stepped off the bench to score in stoppage time as AFC Leopards beat Western Stima 2-1 at the Kenyatta Stadium in Machakos on Saturday afternoon to drag off the relegation zone. Stima had gone 1-0 up through Wesley Kemboi, but Vincent Oburu restored parity for Ingwe before Kaheza ensured all three remain with the blue and white and lift them to 13th spot on the standings. AFC handed new signing David Ochieng his first start in the league since signing for them having earned a starting debut in last weekend’s 4-0 victory in the FKF Shield. Also handed a debut was Rwandese defender Soter Kayumba just signed two days ago from rivals Sofapaka. Stima started the tie on a high and should have gone ahead on the half hour mark when they won a penalty, but Kennedy Otieno sent his effort wide. But, his blushes were wiped when Kemboi broke the deadlock eight minutes later with a well taken shot outside the box. But into the second period, AFC came back charged to get back into the game and they did so after 52 minutes when Oburu was quickest to react when the Stima keeper spilled a shot from Wayi Yeka to tap home . Oburu almost claimed a brace on 59 minutes but his low drive from the edge hit the upright before goalkeeper Stephen Otieno pounced on it as Stima survived another Leopards scare. AFC kept the chase and were rewarded on a quick counter. Kaheza who had come on at the start of the second half for former Stima man brian Marita got to the end of the sweeping move before unleashing a left footed belter past the keeper. Elsewhere Bandari’s poor run continued when they played to a 0-0 draw away to Chemelil Sugar in Awasi.